» The Knicks’ Defense Is Good. How’d That Happen? The Knicks’ Defense Is Good. How’d That Happen? 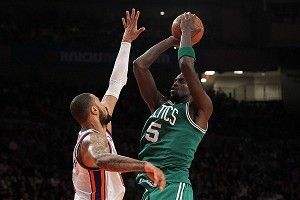 Take a deep breath as I tell you this: The New York Knicks have one of the best defenses in the NBA. They rank fifth in defensive efficiency — which is a measure of points allowed per 100 possessions — giving up just 97.6 points. They are at the top of the list, along with with the Chicago Bulls, Boston Celtics, and Miami Heat. The Knicks consciously focused on their defense after struggling for years. They brought in Mike Woodson, signed Tyson Chandler, and drafted Iman Shumpert to lock guys up on the perimeter. Now they have found defensive success as a result. First, led by Chandler, they play excellent post defense. On post-up plays, they allow 0.73 points per possession (PPP) on just 39.5 percent shooting. 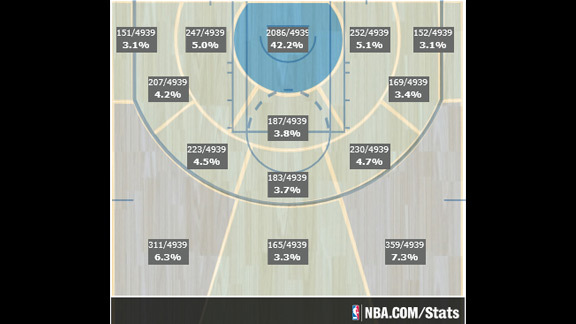 Chandler is very effective near the rim because he is able to contest shots without contact. Because of his length, he can still stop bigs who have a size advantage on him, and because of his quickness, he can stop smaller bigs who try to face him up. He doesn’t need any of his teammates to help with a double team, so the Knicks can defend the kick-out pass efficiently, too — they also have the best PPP when factoring in pass-outs from the post, allowing 0.767 points per possession on 39.2 percent shooting. As Dwight Howard makes the catch on the block, Shumpert reads the play and leaves his man to double team. 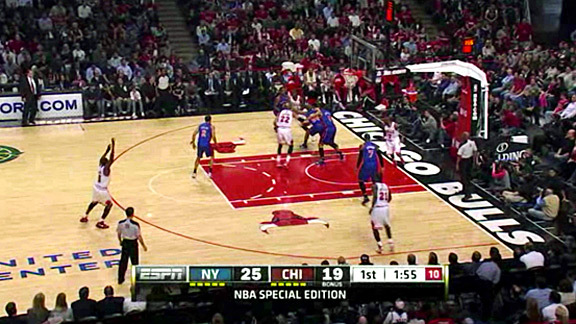 Carmelo Anthony rotates to cover Shumpert’s man. Then, when Anthony sees the pass out, he sprints back to his original man, J.J. Reddick on the wing, closing out hard on him. 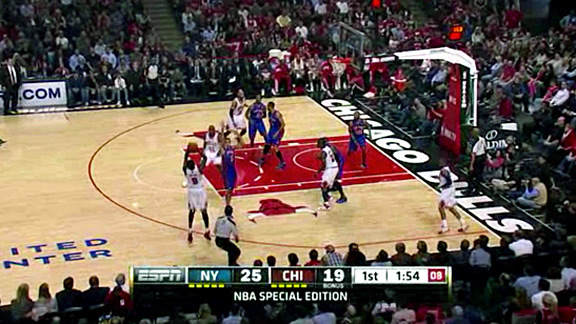 Anthony’s closeout forces another pass — this one to Jason Richardson — and Steve Novak rotates out to challenge the shot. Here the Nets run a pick-and-roll with DeShawn Stevenson setting a ball screen for Sundiata Gaines, and Novak hedges out. Now, Novak may hedge a little too long, but this is the beauty of rotations and helping the helper — it covers up mistakes. J.R. Smith rotates to Novak’s man, forcing a pass. As that happens, Anthony rotates and covers Smith’s man, forcing yet another pass. Now, Novak sprints from his hedging position all the way to the corner, knowing that is where the open man is going to be. Novak gets there in time and he is able to contest the corner 3. 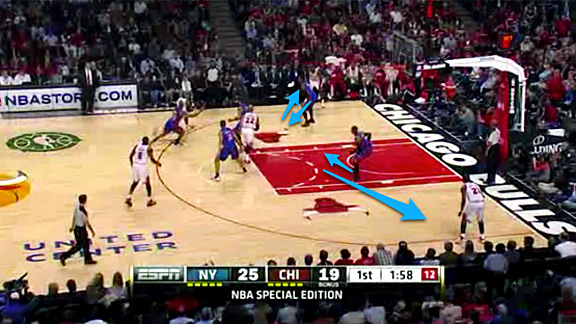 The reason each Knicks player readily rotates is because he trusts that his teammates will do the same. He knows the second, third, and fourth rotations will happen. On this play, the Bulls start in a 1-4 low set. Then their two bigs sprint up to the 3-point line to set screens for C.J. Watson. As this happens, the two defenders responsible for the corner men, Anthony and Smith, get in help position while staying close enough to close out on their respective guys. 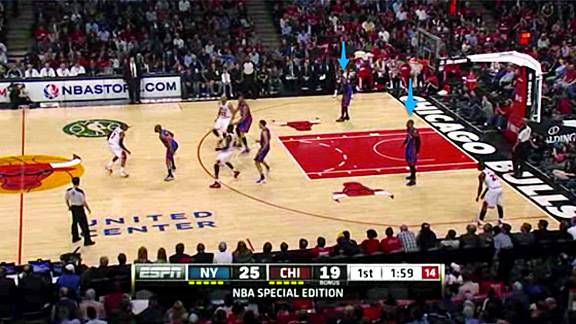 The key here is that they are staying in a position to see both their defensive assignments and the ball. Now as the dribble penetration takes place, they are simply “stunting” from the corner, opposed to fully helping. What that means is that they are showing quickly at the ball handler, taking a step at him in an effort to slow him down, while allowing the defense to recover. Not only are they stunting from the ball-side corner — something most teams do — they are stunting on the weakside, too. Anthony stunts, but then returns to his man in the opposite corner. Watson makes the pass out to Ronnie Brewer, but Smith is right there to contest the 3-point shot. This close-out forces the dribble penetration, but the Knicks collapse (except Anthony, who is staying home in the corner) and forces a kick-out pass. Watch Smith and Anthony defend the corners. If the ball does make it to the corner, the defense is right there, taking away the 3-point shot. Based on the past few years, it’s hard to believe that the Knicks’ defense is actually good. But the videotape doesn’t lie.